On a Wednesday, which is Veterans Day and a welcome day off for most students, Nicky Ouellet is reporting on the Flathead Indian Reservation for a story about the Kerr Hydroelectric Dam, now renamed the Se̓liš Ksanka Qĺispe̓ Project and managed by Energy Keepers, a tribally owned corporation of the Confederated Salish and Kootenai Tribes. 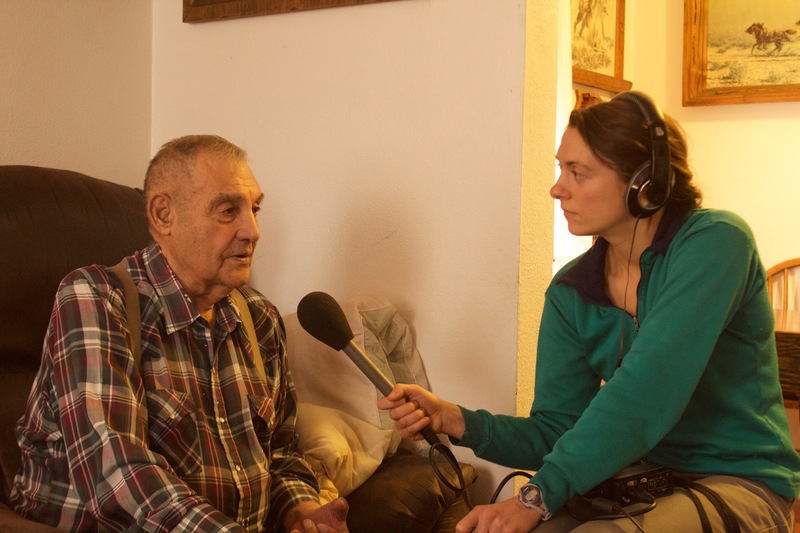 Graduate student Nicky Ouellet interviews Sonny Morigeau, a former tribal council member of the Confederated Salish and Kootenai Tribes. Photo by Andrew Graham. Her interview takes place in a house decorated with paintings of Western scenes, in a tiny town called Old Agency on the shores of the Flathead River. Ouellet is known around the Journalism building as a dogged journalist, but she starts this interview out patiently. Very patiently. Her subject, Sonny Morigeau, is over 80 years old. To reconstruct the process which led to the dam changing hands, Ouellet had to delve into history and interview former tribal council members like Morigeau. For Ouellet, the structure of government on Indian Reservations, and the modern tensions between Tribes and the Federal Government, is not new territory. From 2010 to 2012 she worked for Teach For America, who assigned her to live on the Pine Ridge Indian Reservation in South Dakota. There she taught creative writing, high school English and Journalism. Being a part of life on a reservation, and teaching in a school with a high dropout rate helped push her into the Masters Program for Environmental Science and Natural Resource Journalism. Ouellet became conscious of a national dearth of stories from reservations. Every two weeks Ouellet’s Journalism class filled four pages of the local newspaper. She turned their classroom into a newsroom. “I was teaching myself the whole time too,” she said. When the stories came off the presses, her students were delighted, as was the larger reservation community. At the University of Montana she has focused much of her own reporting on Native American communities. Leaving teaching was hard for Ouellet, but this kind of reporting feels like another way for her to advocate for her students. “I wanted to find and tell stories that would shed a light on inequities in our system,” Ouellet said. This is the first year Masters Candidates will have the choice of a portfolio. “The portfolio option aims to validate the impulse of student who are hungry to explore a broader issue over several semesters, rather than dive deep on a single story, as the professional project does,” said Associate Professor Nadia White, who helps run the Graduate Program. Ouellet’s first story was about efforts to legalize marijuana on the Northern Cheyenne Indian Reservation in Montana. That piece was a long form written story, which ran in the 2015 Native News Project, a School of Journalism program that sends students out to produce stories from every reservation in Montana. She is currently working on this story about the dam takeover, and one about the impacts of oil and gas production on the Fort Behold Indian Reservation in North Dakota. This spring she will be finishing up both stories, and again be a part of Native News, this time as an editor. Back in Old Agency, Ouellet is ready to get what she came for, and begins to gently push her subject towards leading her through the history of the tribal council’s negotiations over the hydroelectric dam. As her questions get more pointed, it’s clear she has done her background work. “Now, Energy Keepers manages the power and sells the power on behalf of the tribes,” she reminds Morigeau when he gets a little off track. Exploring how Native American tribes manage their natural resources is the theme of her portfolio. Three years later, it would appear that she has found hers as well.